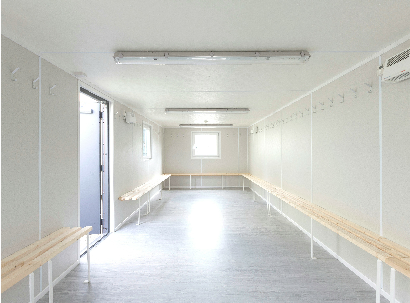 Our secure changing room units are perfect for team sports, such as football, hockey and rugby but also ideal for site workers, holiday lettings, or anywhere that portable changing rooms are required. They provide all the facilities you would expect from a high quality changing room including showers and toilets. If you have a need for new Football or Team Sports Changing Rooms, or have Site Workers, you can recoup the cost of one of our Units in under 6 months with an outright Purchase. There is also the added advantage with our portable changing rooms that if your facilities or sports field changes, the units are easy to move. 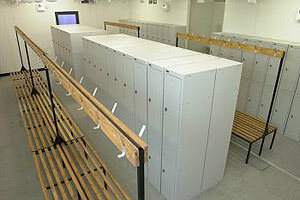 At MAC Containers, we manufacture the most secure Changing Room units in the UK. These are NOT converted old containers, but purpose-built new Anti-Vandal units, of the highest quality, and in accordance with British Standard Codes of Practice BS CP3, BS CP11 and BS 449. A spacious environment, with heating and insulation in winter, light and fresh air in summer, showers, toilets and all with high security personnel doors and windows. 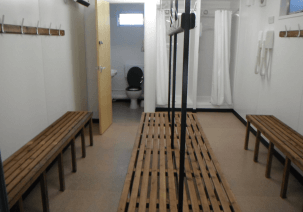 It is also possible to have two complete team changing rooms, c/w benches, showers, toilets and sinks, as well as a separate changing room/shower/toilet for Match officials. All units comply with BS CP3, BS CP11 and BS 449 + MoD Approved Defence Standards 05/29 and HSE 93. The portable buildings are delivered and installed with minimum fuss or disruption. An example cost for a Sports changing room 40' x 10' is £27,995 + VAT. As a bespoke unit you will appreciate there is no rental option. MAC Containers portable buildings - manufacturers of the most secure living accommodation in the UK.